This raw, unprocessed image of the Saturn moon Methone was taken by NASA's Cassini spacecraft on May 20, 2012. A NASA spacecraft snapped dazzling new photos of two Saturn moons and began tilting its orbit in preparation for more a detailed study of the giant planet's poles and rings. The Cassini probe made its closest-ever flyby of the tiny moon Methone on May 20, coming within just 1,200 miles (1,900 kilometers) of the 2-mile-wide (3-km) satellite. Cassini also trained its cameras on the Saturn moon Tethys on that day, imaging the heavily cratered object from about 34,000 miles (54,000 km) away, NASA officials said. 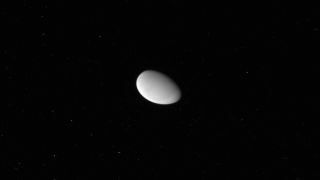 Tethys is much larger than Methone, measuring roughly 660 miles (1,062 kilometers) across. Cassini's Methone encounter was part of a trajectory that also brought it within 593 miles (955 km) of Saturn's largest moon, Titan, on Tuesday (May 22). The Titan close approach is designed to tilt the spacecraft's orbit around Saturn by about 16 degrees out of the equatorial plane, researchers said. The probe's onboard thrusters aren't capable of shifting Cassini's orbit so dramatically, so researchers are relying on boosts from Titan's gravity. "Getting Cassini into these inclined orbits is going to require the same level of navigation accuracy that the team has delivered in the past, because each of these Titan flybys has to stay right on the money," said Robert Mitchell, Cassini program manager at NASA's Jet Propulsion Laboratory in Pasadena, Calif., in a statement. "However, with nearly eight years of experience to rely on, there's no doubt about their ability to pull this off," Mitchell added. Such heavily inclined orbits should provide great views of Saturn's poles and rings, researchers said. But further in-depth studies of Saturn's other moons will have to wait until 2015 or so, when Cassini returns to an equatorial orbit. Cassini discovered Methone and two other small moons, Pallene and Anthe, between the orbits of Saturn satellites Mimas and Enceladus between 2004 to 2007. The three tiny moons are embedded in Saturn's E ring, and their surfaces are bathed in particles of water ice, water vapor and organic compounds that blast from geysers at Enceladus' south pole. The $3.2 billion Cassini mission launched in 1997 and arrived at Saturn in 2004. The spacecraft has been studying the ringed planet and its many moons ever since, and will continue to do so for years to come. Last year, NASA extended the probe's mission to at least 2017.